With a capacity of 14,000 TEUs, an overall length of 365.5 meters and a deadweight of 165,517 metric tons, the MSC Danit became the world’s largest container vessel when finished by Korean shipyard Daewoo Shipbuilding & Marine Engineering (DSME) in 2009. Despite its record size, the most impressive is its excellent performance. DSME used CAESES® for the variation and CFD-driven shape optimization of proven parent ship hull forms in order to arrive at maximum performance and efficiency. The final hull displayed less than 50 percent in wave resistance in comparison to its baseline. 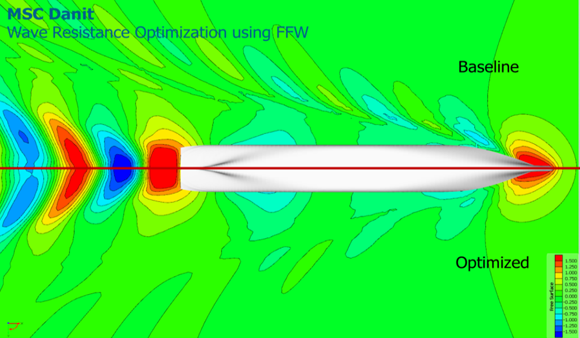 In addition, the hydrodynamic optimization within CAESES® had a favorable effect on the propulsion performance. In a systematic parameter study, the parent ships were varied by swinging the baseline’s sections using the Generalized Lackenby approach of CAESES®. With this transformation, the region of influence on the hull shape can be selected flexibly. In addition the slopes of the shift functions can be defined freely at either ends. Through this, variations may start well forward of the bossing and may end just aft of the forward perpendicular. With zero slopes at the beginning and at the end transitions become very smooth. A series of variants was produced and numerically simulated for wave resistance. 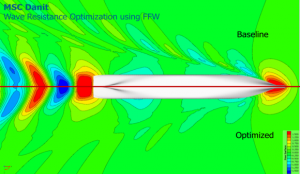 Here, SHIPFLOW, the advanced CFD code of FRIENDSHIP SYSTEMS’ cooperation partner FLOWTECH, was applied. Variants indicated a beneficial modification of the parallel length of the mid-body from 5 percent to 15 percent LPP. Changes to the slope of the sectional area curve (SAC) as available with the Generalized Lackenby were applied in steps of 5° from minus 25° to plus 25°. Through the increase of the parallel mid-body the wave resistance coefficient could be further reduced by up to 8 percent. Additional improvement was achieved through adjusted volume distribution at the forward perpendicular. The hull form finally chosen for model testing featured a straight type and rather steep SAC with pronounced slope at entrance and run and a comparatively long parallel mid-body. The design waterline displayed a small entrance angle and a relatively strong shoulder between stations 12 and 16. The optimization of the ship hull has a lasting and very positive effect on the fuel consumption. With an optimized hull – and powered by its 72,240 kW engine – it makes the most of every ton of fuel. The 14,000 TEU vessel has set standards for speed and shape in its class of mega-boxers. 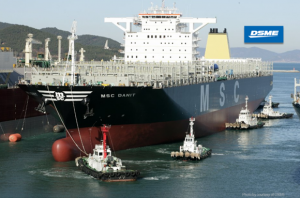 The position of the superstructures in the midship, the engine room located in the aft and the funnel position are very innovative and, all technical and building properties put aside, the MSC Danit is a real beauty.